Relax with the nature of Andaman Sea… Horizon crosses blue sea at a tip of sighting which is Raya Island. 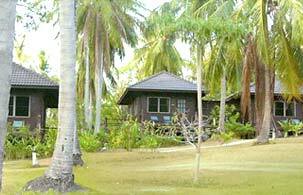 Maximum privacy with Ban Raya Resort and Spa on Kornkae Bay, where is the best for diving and complete aquatic nature. 38 lifestyle guestrooms set in a range of coconut tree with tranquility and privacy ambience. All the rooms are well-constructed and high standard of cleanliness. In Ban Raya Resort and Spa you can enjoy your own privacy far from the crowds. Furthermore, "Sabiang restaurant" offers special delectable dishes from Chinese, Thai, European cuisines by experienced chef. For other extensive resort facilities are available for our guest also.